Hello, I'm new to GIMP and I'm trying to semi-flatten my image for my game so that I can have a texture with transparency. The image can only be a 256 color indexed image (which as I understand cannot have inbetween transparency). So I found that GIMP luckily has a semi-flatten plug-in. I was wondering how I can get it so that it isn't grayed out. I've changed the image mode to RGB and everything that the manual said but the "Semi-Flatten" option is still grayed out. If anyone knows how I can get it not grayed out, please respond. (Aug 25, 2014 04:29)Limits Wrote: Hello, I'm new to GIMP and I'm trying to semi-flatten my image for my game so that I can have a texture with transparency. The image can only be a 256 color indexed image (which as I understand cannot have inbetween transparency). So I found that GIMP luckily has a semi-flatten plug-in. I was wondering how I can get it so that it isn't grayed out. I've changed the image mode to RGB and everything that the manual said but the "Semi-Flatten" option is still grayed out. If anyone knows how I can get it not grayed out, please respond. 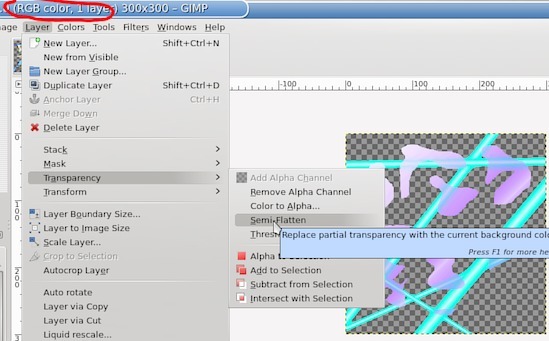 This plugin works on Image type RGB and you must select a layer that has an 'Alpha Channel'. The only way the menu items stay grayed out for me is when those conditions are not met. You have sort-of answered your own question, an indexed image has all transparency or nothing, but I wonder if you have tried the semi-flatten filter. 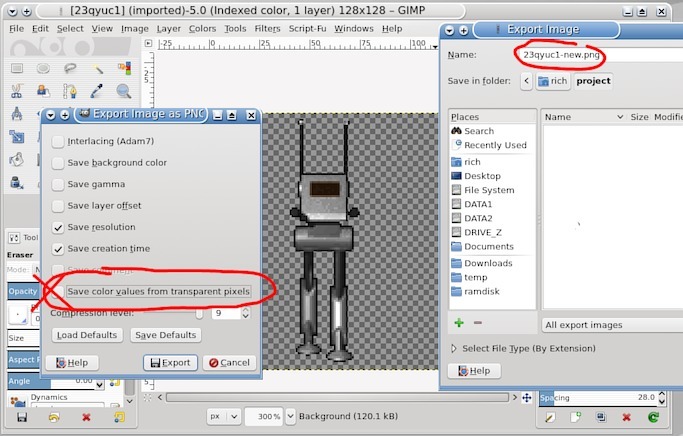 It does what it says, replaces semi-transparent pixels with a colour. 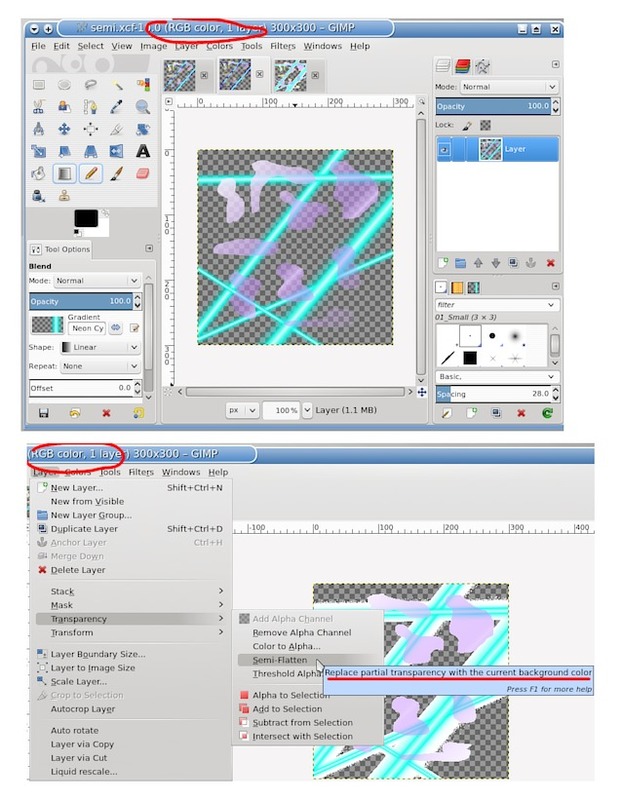 Quote: ..I was wondering how I can get it so that it isn't grayed out. I've changed the image mode to RGB and everything that the manual said but the "Semi-Flatten" option is still grayed out. If anyone knows how I can get it not grayed out. 2. The image has an alpha- channel. But if your image has already been through indexed mode and changed to RGB even if the semi-flatten is active, there is no semi-transparency to work with. Nothing will happen. http://i.imgur.com/iJhiTJi.jpg note at the top - RGB mode. What you probably need is some sort of dithering to simulate areas of semi-transparency/shade. Can you post an example of your work and maybe someone will have a try with it. edit: an RGB image with the semi-transparency you are trying to preserve. This is the test image I'm using. I need this to be a 256-color indexed image with the background completely transparent. It's going to be used as sprites for enemies. The game renders it with a black background currently. You do not have to worry about semi-transparency because that is an indexed image and has none, so semi-flatten is not relevant. I am not into games, but I do know that they often handle transparency in a strange way, even this forum will show thumbnails as transparent = black. It might make a difference, or it might not. 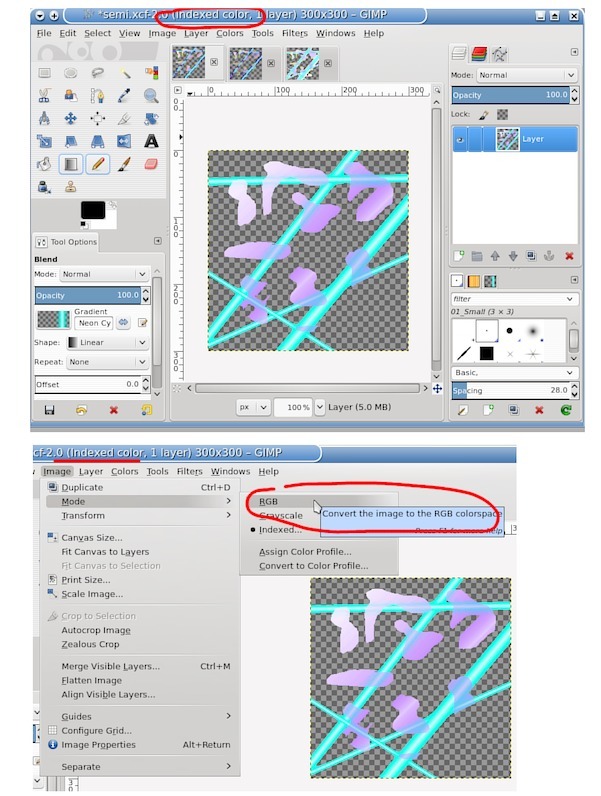 Another way is to re-save the image using some other graphics application such as XnView, that sometimes works. (Aug 25, 2014 18:12)Limits Wrote: I tried that but it didn't work. Does your game have a forum? If it does, ask there.